"Some fake bacons are hit-and-miss, but because bacon is the one thing most people miss when switching to a vegetarian or vegan way of life, it's expected a fitting alternative is created. 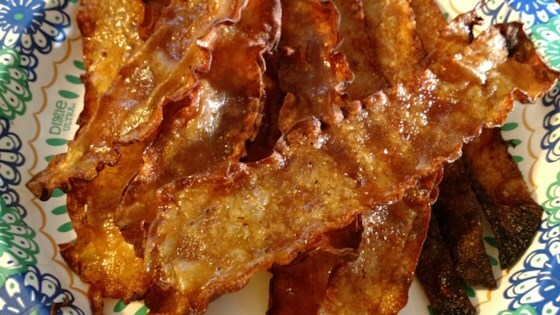 This recipe not only offers a completely meat-free bacon, but one that is low in fat and calories. To mimic the intoxicating aroma that we have come to love in the real thing, we used a combination of liquid smoke and paprika to achieve similar results cleverly using rice paper." Whisk sesame oil, soy sauce, maple syrup, miso, liquid smoke, paprika, and black pepper together in a shallow bowl. Stack 2 pieces of rice paper and soak them in a bowl of cold water until slightly soft and pliable, about 30 seconds. Cut the hydrated rice paper into strips using a pizza cutter. Dip each strip in the soy mixture and place on a sheet of parchment paper. Carefully lay the parchment paper directly on the oven rack. Bake in the preheated oven until strips are dry, 6 to 8 minutes. Chef John has discovered the best bacony way to enjoy eggplant!